Burn Hugh Winchester Gorman (born 1 September 1974) is an American-born English actor and musician. He is known for his roles as Dr. Owen Harper in the BBC series Torchwood (2006–08), Karl Tanner in the HBO series Game of Thrones (2013–14), Dr. Hermann Gottlieb in Pacific Rim (2013) and its sequel Pacific Rim: Uprising (2018), and Major Edmund Hewlett in the AMC series Turn: Washington's Spies (2014). Since 2015, Gorman has portrayed The Marshal in the Amazon drama The Man in the High Castle. Gorman was born in Hollywood, California, to English parents. His father was a professor of linguistics at the University of California, Los Angeles in Westwood, Los Angeles. At the age of seven, Gorman moved to London with his family. He has three older sisters. Gorman trained at Manchester Metropolitan University's School of Theatre. Gorman played William Guppy in the 2005 BBC One adaptation of Charles Dickens' Bleak House, and then appeared as Owen Harper in the first two seasons of the BBC science fiction series Torchwood. Other television roles include Funland and Bonekickers, amongst other projects for the BBC, and he also appeared in Channel 4's political thriller Low Winter Sun. He played scriptwriter Ray Galton in the BBC Four television play The Curse of Steptoe. He has also appeared in television series such as Dalziel and Pascoe, Casualty, Merseybeat, and The Inspector Lynley Mysteries. Gorman played Jed on the soap opera EastEnders in March 2007. He starred as Hindley Earnshaw in the ITV adaptation of Emily Brontë's Wuthering Heights. In 2011, he starred in Sky1's second Martina Cole adaptation, The Runaway, and in 2014, portrayed Adam, the lead character's stalker and fellow immortal, in ABC's Forever. On film, he has had roles in Layer Cake, The Best Man, Penelope, Fred Claus, and Cemetery Junction. He has also appeared as Dr. Hermann Gottlieb in the film Pacific Rim and its sequel Pacific Rim: Uprising. Gorman's stage credits include Ladybird (Royal Court), Flush (Soho Theatre), and Gong Donkeys (Bush Theatre), prompting Michael Billington of The Guardian to write that "Gorman proves that he is one of the best young actors in Britain". He has performed in readings, workshops, and development initiatives with the National Theatre Studio, Young Vic, Royal Court, Oxford Stage Company, Paines Plough, and Soho Theatre. Outside London, he has worked with Nottingham Playhouse, the Theatre Royal, Plymouth, and the Royal Exchange and Contact Theatres, where he was nominated for a Manchester Evening News Best Newcomer Award. From 2008 to 2009, Gorman played Bill Sikes in the West End revival of the musical Oliver!, for which he was nominated for Best Supporting Actor in a Musical in the 2010 Whatsonstage Theatre Awards. Gorman has played in clubs and on stages all over the world, appearing alongside Neneh Cherry, Rodney P, and Groove Armada. He has worked on music videos and visuals with The Streets. Under the stage name of B.B. Burn, he was part of the human beatbox outfit Drool Skool, alongside Shlomo, DukeBox, and A-Plus (Alex Tew, known as the founder of The Million Dollar Homepage and Calm). Gorman was crowned the BBC 1Xtra Human Beatbox Champion in 2003..
Gorman married Sarah Beard, a school teacher, on 17 July 2004. They split in 2017. Beard gave birth to their first child, son Max Hugh Gorman, in Cardiff in 2006, whilst the first series of Torchwood was in production. The couple's second child, daughter Nell Gorman, was born on 25 January 2009. Rosa Gorman, the couple's third child, was born in September 2014. 2000 Casualty Geoff Simpson Episode: "Not Waving But Drowning"
2001 Merseybeat Sean Finnigan Episode: "Coming of Age"
2005 The Inspector Lynley Mysteries Billy Verger Episode: "In Divine Proportion"
2007 Agatha Christie's Marple Jacko Argyle Episode: "Ordeal by Innocence"
2007 EastEnders Jed Episode: "3166"
2008 Bonekickers Banks Episode: "The Lines of War"
2011 Lark Rise to Candleford Reverend Marley Episode: "4.3"
2013 It's Always Sunny in Philadelphia Scientist Episode: "Flowers for Charlie"
^ Herman, Sarah: "Burn Gorman, Where's Your Head At?". , Torchwood Magazine (August 2008): page 60. (wayback 20120313031654). Here, Burn states that the name on his birth certificate is "Burn Hugh Winchester Gorman". 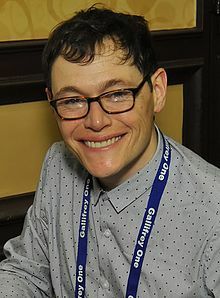 ^ "Chicago TARDIS 2015: Burn Gorman During a talk at the Doctor Who convention Chicago TARDIS, which took place from 27 to 29 November 2015, Gorman was prompted to point out inaccuracies in his Wikipedia article. He allowed the moderator's reading of his name as "Burn Hugh Gorman", but clarified, "For a while [...] I would get some questions saying 'So, your name's Burn Hugh Winchester Gorman?' and I don't know where that started! It may be with Wikipedia, or something, but for some reason somebody had edited and put my name as 'Burn Hugh Winchester Gorman', and that is not either true or relevant in any way. So that is a lie." (timecode 9:00-9:35). ^ "Meet the characters and cast of Wuthering Heights". PBS.org. Retrieved 29 December 2015. ^ "Notable Alumni". Manchester Metropolitan University. Retrieved 29 December 2015. ^ Michael Billington (8 November 2004). "Gong Donkeys". The Guardian. Retrieved 24 October 2006. ^ "Flush by David Dipper" (Press release). Soho Theatre Company. 22 April 2004. Archived from the original on 19 May 2006. Retrieved 21 April 2006. ^ Bamigboye, Baz (9 May 2008). "Watch out for... Burn Gorman in Oliver!". Mail on Sunday. Retrieved 12 May 2008. ^ "Game of Thrones' Burn Gorman". Global News. Retrieved 21 March 2016. ^ Whitbrook, James. "Hell Yeah, Burn Gorman Is Joining The Expanse". io9. Retrieved 2019-02-07. This page was last edited on 15 April 2019, at 06:05 (UTC).